Please welcome back to Dredd Reckoning Mr. Graeme McMillan, star of stage, screen and Internet. Graeme joined me a while ago to discuss Red Razors, and he is of course a contributor to Blog@Newsarama and Robot 6 and I Am Graeme McMillan's Blog and Spinoff and, these days, The World That's Coming. Graeme, if you'd lead us into Swimming in Blood...? GRAEME: It's possible that the entire concept of "You Can Never Go Home Again" was created because someone had realized that, at some point in the future, I would re-read these very "Devlin Waugh" comics and think "THIS is what I loved so much twenty years ago? What was I thinking?" I think that, in whatever part of my comics-addled memory I was storing these stories, I'd managed to blank out how formulaic they actually were, and how maddeningly and frustratingly odd the pacing could be. Reading them back now, more than once I found myself reminded of Mark Millar - not the Millar of "Red Razors," thankfully, but his more famous work, especially Marvel's Civil War - with his habit of trans-Atlantic expeditionary dialogue and sacrificing dramatic tension for a punchline at the most inopportune of times. "Devlin Waugh" is arguably the most mainstream that writer John Smith ever got, and his other work of this period ("Indigo Prime," "Firekind," "Revere," etc.) 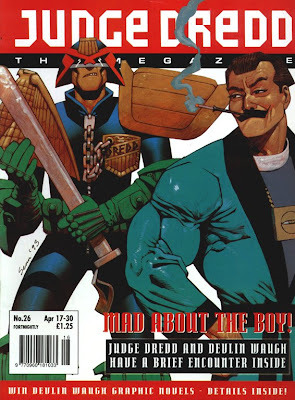 from 2000 AD has aged far better than this, but nonetheless, I ended this book trying to work out if calling him "The Queer Mark Millar" was an insult or not. That said, when Smith can rein in the temptation to have Devlin dive towards whatever camp bon mot is on offer, there's a lot to like in this collection; for all the supernatural elements, Devlin makes sense as a Dredd character because of his humor, whether it's the pun in his name or his job, which seems to fit into the Dredd formula of "Take something in today's world but push it to an unexpected extreme." (It's the Vatican - but they employ freelance monster hunters! There's a high-concept sheen to it that you can imagine Wagner and Grant coming up with for a one-off episode somewhere in their 1980s heyday, don't you think?) That the character comes off so often as two-dimensional also works in his favor, for me at least, weirdly; my favorite 2000 AD characters aren't so much fully-fleshed out characters as much as shorthand stand-ins that can be dropped into stories without much explanation in five-page installments, with everything else coming from there, and from that point of view, Devlin is completely covered. But the stories…! Both of the lengthy stories in this collection ("Swimming In Blood" and "Fetish") fall apart at the end, as Smith seems to realize that he's become far too enamored with setting the stage and creating atmospheric scenes of foreboding, at the cost of really coming up with a plot machine that can deliver anything remotely approaching a satisfying conclusion, and so the climaxes seem messy, rushed and, in "Fetish"'s case, somewhat nonsensical. (Seriously, I know it's a Dredd story and all, but to see the story devolve into "I can PUNCH THIS PROBLEM AWAY" is just unfortunate.) But to complain about that feels like it's missing the appeal of Smith's writing, which has always seems to be more about the language and the ideas during the journey, as opposed to the actual plot of the story being told. Something else "Fetish" fails at: Having artwork that is clear enough to decipher. I remember the joke from this era of British comics that Simon Bisley's legacy would be to teach artists how to create muddy artwork too dark to print properly, and Siku's paintings in this story completely prove that point… Possibly the originals looked spectacular, but on the printed page, they're just a mess. 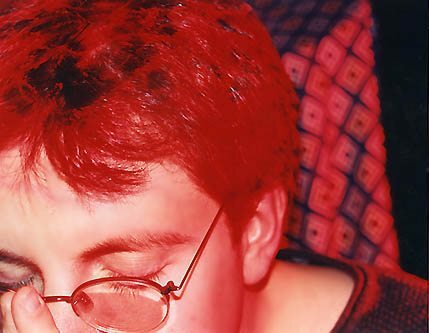 But maybe it's the printers' fault; Sean Philips' work on "Swimming in Blood" also seems curiously darker and less clear than I remember it. I have to admit, I came away from this book liking Devlin as a character, and liking the idea of the stories more than the stories themselves… Is that just me? Actually, can you please explain Smith to me a bit more? He's been described to me as "the one great 2000 AD writer who never caught on in America" (and his American work consists of one issue of Hellblazer, a Scarab miniseries, a bunch of issues of Vampirella of all things, and not much else besides). He's not much of a public figure; I've seen a couple of brief interviews with him, and that's it. He mentions in passing in Thrill-Power Overload that he's disabled. His work seems to come in bursts. "Indigo Prime," which you've mentioned is one of your favorite things of his, appeared in a set of stories between 1989 and 1991, then all but totally disappeared until this year. He wrote a pretty impressive horror serial in 2000 AD called "Cradlegrave" that just got collected a few months ago. I do not get him. And it's not like I dislike his writing--I like it a lot sometimes, especially "Cradlegrave" and the recent "Indigo Prime" material--but I get the strong sense that there's something interesting in there that I'm missing. What would you say is distinctive about Smith's sensibility, or key to understanding what he's up to? 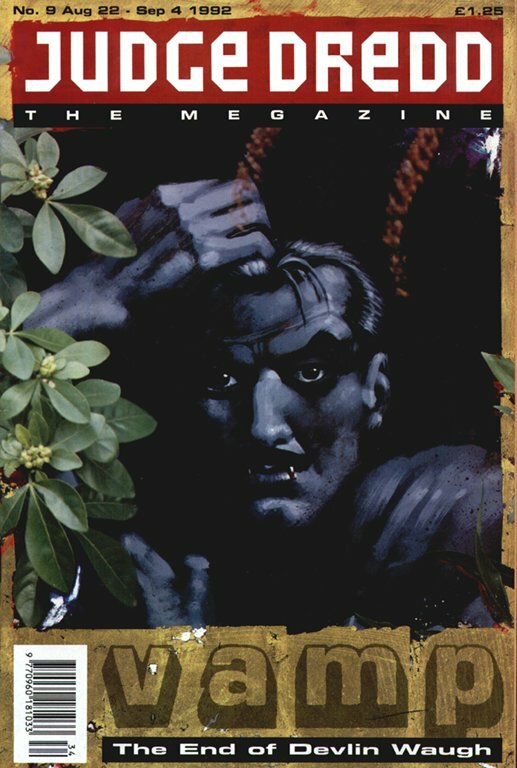 GRAEME: I'm very tempted to say that being a John Smith fan is a somewhat masochistic enterprise; he's definitely more in the Grant Morrison/Peter Milligan mold than a more traditional John Wagner/Alan Grant/Pat Mills style, with influences leaning more towards the esoteric than the meat-and-potatoes mainstream of 2000 AD writers from days of yore, but as cruel as it sounds, I think what really distinguishes him from other writers is his tendency to get lost within his own stories. The Scarab series he did for Vertigo is a great example of this; he throws up lots of potentially interesting ideas and possibilities in the first few issues, but instead of developing them, he goes off and finds some more, and then some more, and seems surprised when the series nears its ending leading to a deus ex machina-esque final issue. Ultimately, I think Smith's lack of focus - whether it's maintaining his own, or bringing his stories into focus - is his selling point as well as his drawback. Those readers who always feel that the complaint that Grant Morrison's stories read like he's on drugs is unfair because that would make them more scattered, interesting or wilder would be well served by Smith, I think, but those for whom Morrison or Milligan is too outré... best stay away. Almost all of Smith's best work - or maybe his most important - is out of print now, sadly. New Statesmen, his attempt to create a post-Watchmen superhero political thriller based in a future America, saw early work from Duncan Fegredo and Sean Phillips, and is another noble, fatally-flawed, series worth reconsidering, and "Straitgate," his coming-out body horror series, again with Phillips (check out the Dave McKean-"influenced" title page here--ah, 1990...), is one of those wonderful, lost classics of British comics. Thinking about it now, it strikes me that Smith really specialized in body horror. Maybe something to do with his only having one arm...? Hmm. And, in fact, the final page of that first episode is a bit different in the reprint. The first word balloon of the original page, as above, has Waugh simply saying "You can all breathe a sigh of relief, gentlemen. Fingers off the triggers..." In the DC edition, that becomes "Fingers off the triggers, sphincters unclenched..." That's the way Smith wrote the line, and he was apparently annoyed that it had been censored; editor David Bishop later claimed that "I cut the part about 'sphincters' purely due to my own ignorance - I'd never done biology and hadn't a clue what a sphincter was!" 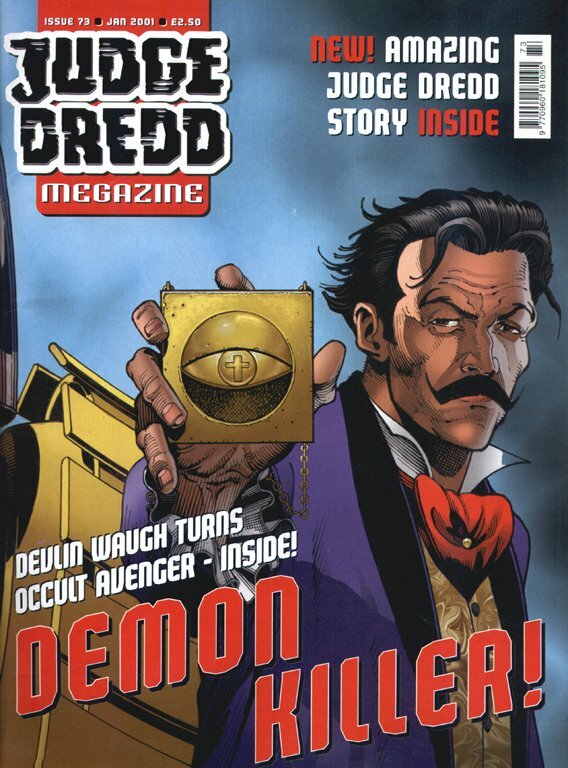 As Bishop's text feature in Judge Dredd Megazine #201 explains, "Devlin Waugh" seemed a bit cursed for a while as a series. 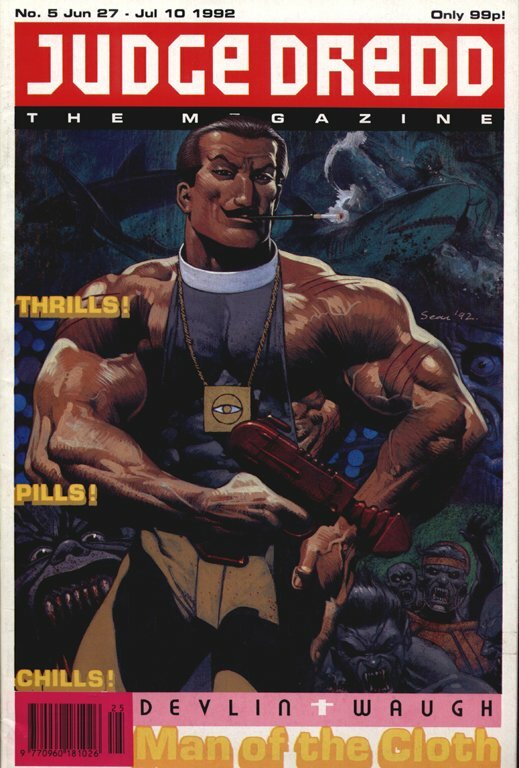 The second significant Devlin Waugh storyline, "Fetish," was originally going to be seven episodes of 17 pages apiece (and had been proposed as a Dredd story involving "Judge Tarzan"--who became Shaka--and didn't initially have Devlin in it at all). Ashley Wood was going to draw it, sat on it for a year, completed five pages in painted color, scrapped that, redrew four of them in black and white, then gave up. Company policy at the time was that any work paid for had to be published, so Bishop wrote a new script (as "Johnny Mondo") for those nine pages--four of which were essentially duplicates of others--and published it as a Judge Karyn story called "Visions" in Megazine #3.08, which served as a teaser for "Fetish." (A page from that version appears above, speaking of Dave McKean-influenced work...) Then he cut Smith's script for "Fetish" down to five episodes and turned it over to artist Siku, who'd drawn the Pan-African Judges strip, among other things. By the time it finally started appearing, it had been four and a half years since "Swimming in Blood" had finished its run. ("A Mouthful of Dust"--drawn by Michael Gaydos of Alias, surprisingly--took nearly two years to appear after that, and when it did, the first episode was apparently printed in scrambled order. Cursed!) And yes, "Fetish" is a mess--as a story it's baffling and rambling, and Siku's art has a lot of beautiful textures and colors and a near-total absence of narrative clarity. Here's another question for you, Graeme: what do you make of the two prose stories at the back of this volume? More broadly, can you explain what the deal is with prose stories about comics characters in British annuals and such? 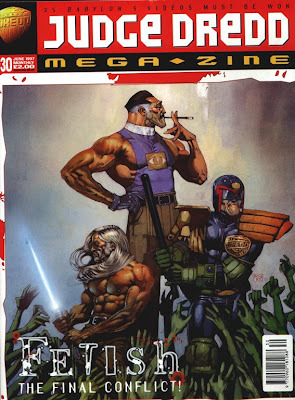 2000 AD seems to have had a lot of them over the years--there's actually a recent e-book-only collection, Sweet Justice, which includes a bunch of them by Neil Gaiman, Peter Milligan, Mark Millar and others. How did that particular tradition evolve? Smith was amongst the strongest of the 2000 AD writers who handled the prose stories, although I'm not sure that's necessarily on display in the two stories that end this collection; both of these seem written in a particular style that's more traditional than the one he used when handled "Indigo Prime" or "Tyranny Rex" prose stories elsewhere in 2000 AD history, but I wonder if that's an attempt to stay within the tradition of Devlin's literary ancestors more than anything else. I like these stories, though; maybe more than the comic material in the collection, because they're not fighting with unclear visuals for attention, and also because - being so short - they allow Smith to meander and not feel compelled to fit within some idea of Thrill-Powered Epic. They feel closer to "pure" Devlin, if that makes sense. But what did you make of them? DOUGLAS: I enjoyed both of them, although they also succumb to the tendency to keep throwing ideas out until it's time for the story to be over--the big surprise at the end of "A Love Like Blood" is that, gasp, Devlin's stalker is a girl! (Come to think of it, both prose stories are basically about stalkers.) And as frustrating as everything in this book can be at times, I keep running across elements of Smith's stories that I really like--a clever idea, a well-turned bit of prose--and his jokes are usually pretty funny. Has he ever written a straight-up comedy? I grinned at the bit about "munce Thermidor," and at the throat-clearing innuendo of the conversation between Devlin and Chigley: "'Are you, by any chance, a demon yourself?' There. Coming right out with it." Speaking of throat-clearing innuendo: both of these stories go a bit further with the "GUESS WHAT? HE'S GAY!!!" stuff than I suspect Smith would've gotten away with in the context of comics. (Another terrific line from "A Love Like Blood": "They'd become friends under the pier, water round their knees, listening to the creak and groan of moored yachts.") 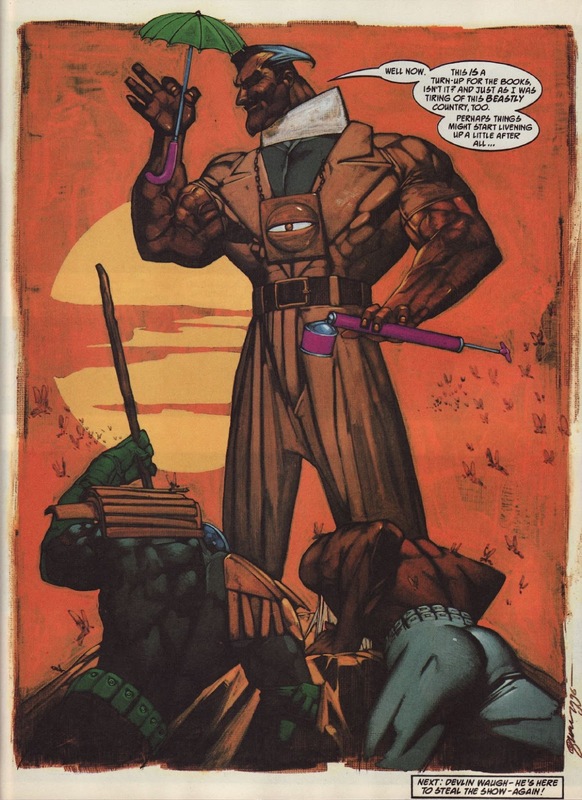 1992 really was the optimal moment for a character like Devlin--I can't imagine it'd have been possible for mainstream comics to feature a really flamboyantly gay main character much earlier (Extraño had come along four years earlier, but he wasn't really the type who could carry his own feature), or for a protagonist that flamboyant not to be a questionable stereotype by a few years later. I don't really find that Smith sacrifices dramatic tension for punch lines--part of what's so much fun about Devlin as a character is that he not only refuses to take anything seriously, but delights in annoying anyone around him who does take things seriously. Any time he's in the same space as Dredd, especially in "Brief Encounter," he gets to play Groucho to Dredd's Margaret Dumont. I also admire the fact that Smith's willing to kick the status quo of his projects, hard. Turning Devlin into a vampire at the end of "Swimming in Blood" probably weighed down the concept of the series with one more element than it needed, but it also signaled that this was not going to be a project like Dredd where the premise can't really change at all. 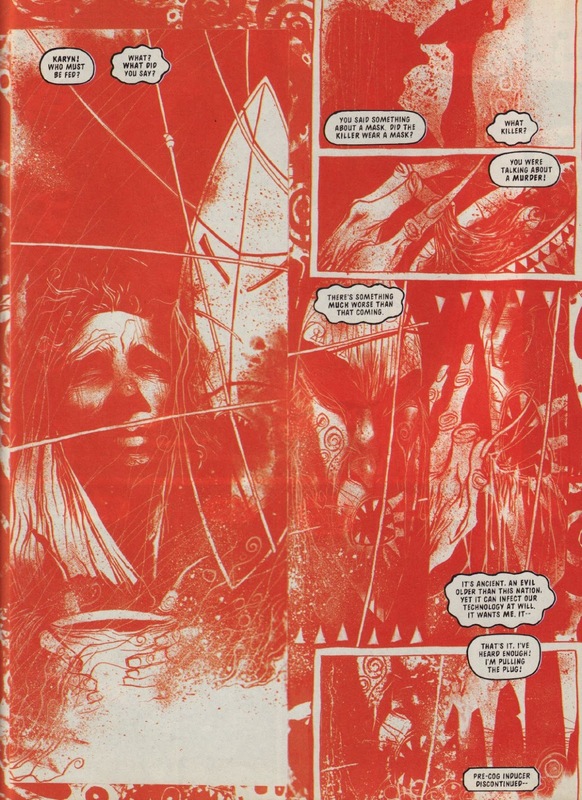 I will say, though, that I think a lot of what makes "Swimming in Blood" work is Sean Phillips' artwork. He varies the look and style of his artwork just enough to underscore the tone of one sequence after another: watercolors for the establishing shots of the Bahamas, Münch-ish gobs and smears of paint for the sequences we see from the vampires' perspective, the checkerboard floor tiles that ground the sequences in the morgue and make it look even more prison-like, the blue-green glow of light-through-water that comes through Aquatraz's windows. I particularly like the way he draws Devlin's face in profile whenever possible, or puts him in muscle-mag poses, even when that's totally incongruous with what everybody else in the image is doing. That's actually one of the problems with Siku's art that sinks "Fetish," beyond the dark-and-muddy issue: he paints every sequence exactly the same way, and uses every layout trick he can find to avoid giving us a clear look at any character's face or body most of the time, maybe because he knows actual figure drawing and face acting is his weak point. Compare the end-of-chapter Devlin-arrives image above from "Swimming in Blood," and the one below from the third chapter of "Fetish." They're very similar images in pose and composition (down to the big circle in the background! ), but the Phillips painting gets enormous mileage out of subtleties of his expression and outfit and pose, while Siku's gives us almost no fresh information other than the gag of Devlin's teeny little parasol. So maybe if I can ask you to cast your mind back a bit to when these stories first came out: what did you make of them (and of Smith, and of Devlin as a character) at the time? What was so striking about them then? GRAEME: I seem to remember that Smith was very much on my radar at the time this series first appeared; definitely "New Statesmen," "Tyranny Rex" and "Indigo Prime" had appeared, as well as the first book of "Revere" (a short, mostly-forgotten 2000 AD series that may be my favorite Smith thing of all). I remember very clearly that Devlin was by far my favorite Megazine strip, and the one that kept me buying the series - I dropped it not long after "Swimming in Blood" was finished, and then came back to it when the character reappeared for the one-off meeting much, much later. What stood out for me was Smith's ability to create a particularly un-Dredd-like atmosphere. 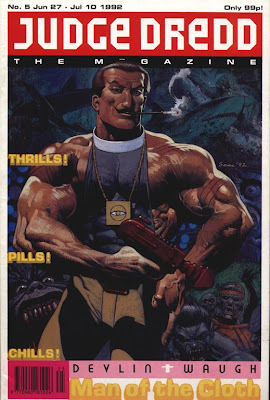 "Swimming in Blood" lacks the safeness that Dredd has, if that's not an odd thing to say; part of the essential Dredd tone, I think, is a comedy and humor that makes even the most gruesome event somehow "okay" for the reader, but Smith's work in general is much more freewheeling and evocative and filled with dread. (Part of the reason that something like "America" has such impact, I'd argue, is that it knows when to pull back on the comedy.) "Devlin Waugh" is the first time that he manages to successfully marry that to a more familiar, 2000 AD/Dredd-like lead character--there's comedy in "Tyranny Rex" and "Indigo Prime," but it's very, very different humor--but it still has a feeling of uncertainty and danger that's very seductive. This is, of course, not a trick that can be sustained for a long time; once Devlin's in his fourth or fifth series, the reader starts to realize that he's probably going to end up okay. I get what you're saying about his becoming a vampire at the end of "Swimming in Blood," and that's partially what I mean about the danger and sense that "anything can happen!" But when nothing else has really impacted or changed the character since, that story starts to take on an origin story feeling, the creation of the status quo instead of a sign that there IS no status quo. Re-reading these stories now, decades later, when Devlin's made more appearances since, the feeling of uncertainty seems quaint and almost unreal in retrospect. He becomes a vampire because that's the final twist in his high concept, not because it's Smith showing the consequences of his horror story adventure. Thanks again, Graeme! 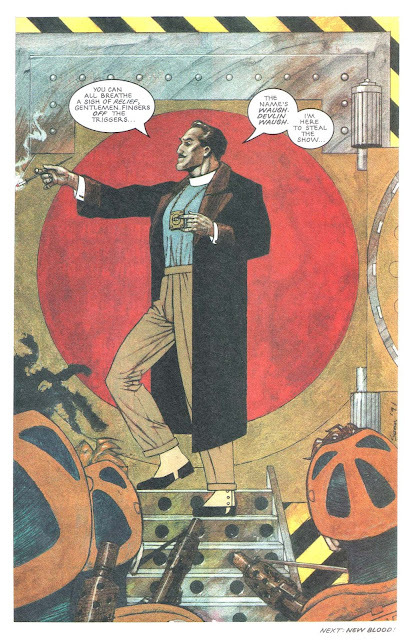 Next week: it's time to polish off the extant Complete Case Files with volume 18, featuring the first two "Mechanismo" storylines--although there will apparently be at least a couple more Case Files volumes coming before this blog runs out of books to cover weekly. I just read the Chopper collection you reviewed a few months ago. That second story was really good! Thanks for all the background on one of my fave Smith characters. Didn't know half of it. And spot on observation: the idea of Devlin Waugh is definitely more interesting than the execution of the stories.